Our kids typically have known a bit a trouble in their lives, and are at a time where they really benefit from adult guidance. To that end we have conceived the 1949 project. We will mentor our young people along in the restoration of a Packard. She's been sitting in a barn since the eighties. I was told she was in fine mechanical condition until that point. There is very little rust that I can see, and that car appears remarkably intact and complete. I am trained as a therapist, and have embarrassingly few engineering skills - so I hope to prevail on the good will and expertise of visitors here as we guide our young people along on the restoration. The 23rd series Eight is a great road car. I had mine just down the road from you this summer at the Packard Museum meet in Warren. Thanks for the vote of confidence John. Reading some of the fine project blogs here, I am intimidated by the vast and wide-ranging scope of engineering know-how. Oh well, I am trying to teach our young charges to overcome fear... so let it begin with me. While in FL over the holiday I spotted a beautiful cormorant while out on an airboat. I took this as a good omen - and purchased the Packard upon my return to Ohio. 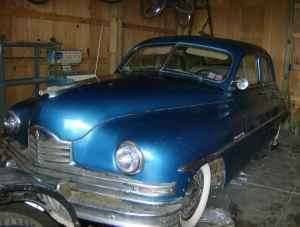 Well, we've just made our first parts purchase for the 1949 project. I got this for 103.50 at an ebay auction. John we'd certainly appreciate any guidance, consulting... even working with the kids. While they will surely benefit from skills learned - it's really about the healing in the relationships. I have THAT car..well, a 50, but essentially the same. Is that a 49 1/2 ultramatic automatic or a 3 speed on the column? Assuming a 288 engine? I've never been associated with the packard museum in warren, but we did use to have their account fixing their computers for awhile. I've wanted to become a supporting member there for some time, but i digress. I'm almost right up the road from you guys (Over in Howland, right by Warren) about an hour away. My time can be tight with my own projects, but i can definitely spare some to help a fellow packard new comer with such a good cause. PM me if you need any help or advice, and we can exchange contact info. I don't know NEAR as much as many others here, but i can research and find most anything, and even the most difficult problems to diagnose via the internet can become easy in person. Thanks for the kind offer cortcomp, I'll definately keep you in the loop. It's a three on the tree alright. The 288 I believe. I'm having her flatbedded up from Amish country (Millersburg) on Friday. We don't have a garage at the institute on W. Market in Akron, so we'll store it in a garage nearby until we can find a garage bay that we can work in. I can see this becoming a rolling restoration, so the engine and brakes would likely be the first order of business. Where do you start with a car that was parked when all the chicks had big hair? Where do you start with a car that was parked when all the chicks had big hair? Dont know about that, but my car was parked where the rats like to dine on upholstery and wiring. "While it's nice to be important, it's important to be nice." "Although no one can go back and make a brand new start, anyone can start from now and make a brand new end." Thats how i got my car, back brakes stuck and hadn't moved after 10 or so years. You start with the master cylinder on the drivers side down on the frame and get some brake fluid in there, because it'll be dry. We took ours out, broke it down, had it clean in about 10 minutes and back together, bled the brakes (no air in line amazing for a dry cylinder) and brakes were tops! Then just try some testing starting, shifting, etc and go from there!